Toshiba AT300SE review | What Hi-Fi? You might remember Toshiba’s slim, budget AT300 tab from last year and this refreshed model sports similar specs in a slightly chunkier package with one big upgrade: Android 4.1 (Jelly Bean). So the Toshiba AT300SE is certainly slicker than its predecessor when navigating your way through apps but can still be a little sluggish here and there. Still, it’s a capable value option with two cameras and a microSD slot for extra storage, although it’s let down by the shoddy metallic-looking plastic back which wimps out at the first sign of a scrape. Film buffs are spolit for choice with Google Play and Acetrax, accessed through Toshiba Places, but picture quality is only so-so in both standard- and high-definition, with washed out colours and blacks that aren’t as inky as we’d like. The AT300SE is nice enough to navigate, but with a less than durable finish, uninspiring video and Toshiba dropping ports such as microHDMI, it just doesn’t represent great value for money. 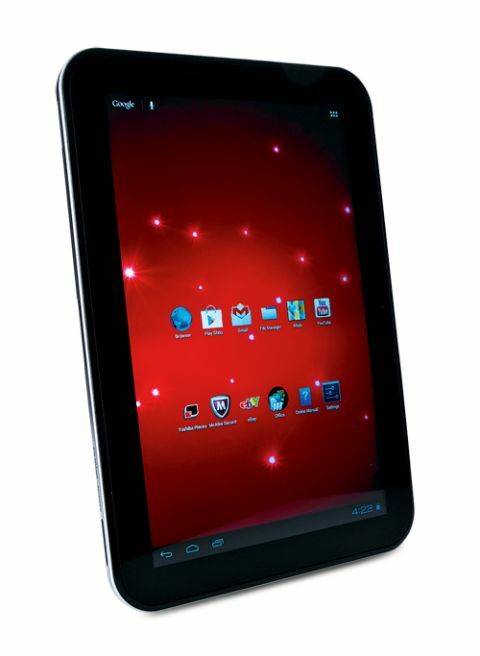 We’d recommend trying a smaller tab or spending more on the Google Nexus 10.